Police have removed a gilded, larger-than-life statue of Turkish President Recep Tayyip Erdogan erected on a central square in the German city of Wiesbaden after municipal authorities said it posed a threat to security. About 100 police officers were stationed at the Platz der deutschen Einheit (German Unity Square) in Wiesbaden last night before calm returned, city authorities said. 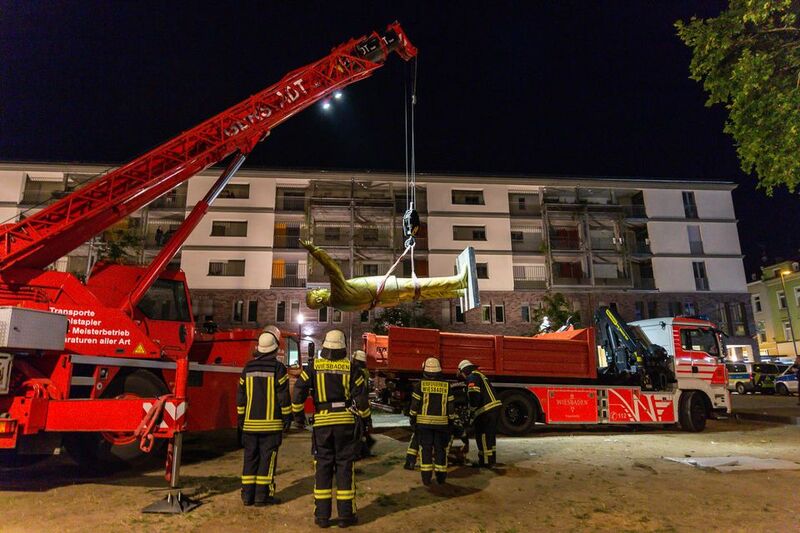 Photos posted on Twitter overnight showed fire officers removing the two-tonne sculpture with a crane. Though some people posed for selfies with the statue before it was removed, it also attracted vandals, with one man captured on video spraying Erdogan’s suit. Others voiced anger on Twitter. “Erecting an Erdogan statue is not art, it is a slap in the face to all those who fled this dictator and came to Germany,” tweeted Ali Utlu of Cologne. Luz said the Biennial, which aims to cross borders between theatre and art, is seeking to defend artistic freedom. "We were pleasantly surprised by the positive statement from the city recognising artistic freedom yesterday,” she says. The Turkish Consulate in Frankfurt also requested the statue’s removal, Luz says. UPDATE: This story was updated to include the latest comments from Wiesbaden city authorities.